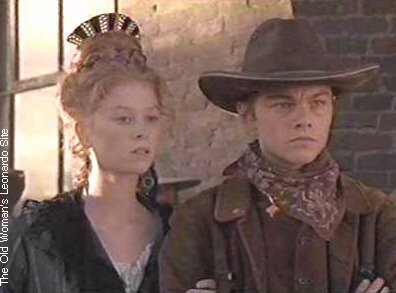 The skuttlebutt was that Leonardo DiCaprio originally turned down the role of "Fee, the Kid" in this 1994 film, and only accepted the part after co-producer and star, Sharon Stone, hand-selected him and begged him to work on the project. Also in the film are Gene Hackman and "Millenium's" * Henrickson (in a surprising role as a poker-playing, long-haired, somewhat narcassitic shootist). THE PLOT: About 20 years ago Mr.Herod (Hackman) was instrumental in the death of the marshal of an unnamed town. Since that time, he's been running the place with an iron fist, keeping the general population under his thumb and on the brink of poverty, while he lives in splendor and subjects the town's inhabitants to "games" of duels in the street. Into the town comes Lady (Sharon Stone), a sour, gun-toting woman with a chip on her shoulder and readiness to murder Herod. Because he's so heavily protected, she can't kill him outright, so she-- along with a cast of other Western stereotypes (the preacher, the scar-faced man, the Indian, the card shark) -- joins the next "game". 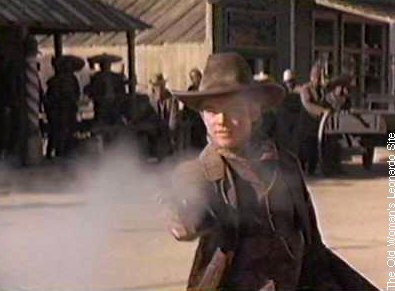 The rules of the game are simple: Each participate can challenge any of the others to a gun-shooting duel. Whoever is alive at the end of the game win a cash prize. 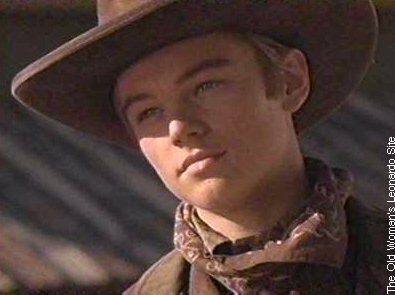 To Herod's surprise, however, his son Fee, "The Kid" (Leonardo DiCaprio) has signed himself up for the game in an attempt to impress his father with his skill. Not willing to be outdone by his own son, Herod adds his name to the contest as well... and the game begins. Little by little viewers discover that Lady wants to kill Herod because he had forced the death of her father, the man who was once the marshal of the town. When Lady was a child, Herod and his gang broke into the marshal's home, and dragged him outside. Herod strung the marshal up and was going to hang him, when Lady ran out to try to rescue her father. Herod handed her a gun and told her that if in three shots she could shoot the rope that was being used to hang her father, he'd let her father live. Unfamiliar with guns, but willing to do anything to give her father a chance at life, Lady fired at the rope... and struck her father in the head by mistake. Now, a grown woman, Lady wants Herod dead. The Preacher, Cort, viewers learn was once an expert gun-slinger who later renounced violence and became a minister of God. The only reason why he was participating in the contest was because Herod was forcing him to. The Kid is having difficulty gaining his father's respect in part because his mother was unfaithful to Herod, and Herod isn't entirely certain that the Kid is really his son. He refers to the Kid as a "farmer" and complains that he doesn't have the hands of a shootist. Herod also hates his son because everyone in the town loves and reveres the Kid. When the Kid wins his rounds in the contest, all of the townspeople applaud him and carry him around on their shoulders. When Herod wins his own rounds, the people are silent and only supply him with meager applauses when he threatens them with retaliation of they don't. In the game, as each challenge is given and accepted, the list of participants dwindles until there are only four contestants left: Lady, the preacher, Herod and the Kid. 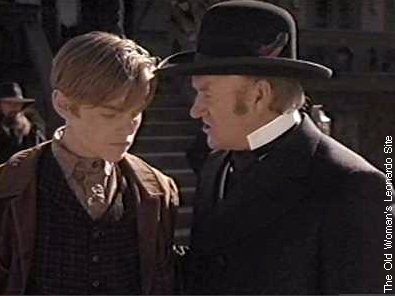 The Kid faces his father in the street and is stunned when, on the stoke of the town's clock tower, both he and father fire their guns at the same time. Herod is struck in the throat and falls, but doesn't die. Breathlessly exclaiming, "That was fast," the Kid crumples. As he lays in the street, he sees his father approach him. The Kid puts a hand out to Herod, silently begging the man to show him some sign of love and respect. Herod refuses, and the Kid dies in the arms of his lover and Lady with tears in his eyes. Although the townspeople had turned on all of the other contestants killed in the game, and stolen from them all of their clothes, possesions, and even their teeth, when the Kid dies, the townspeople silently and respectfully carry him away untouched. The preacher and Lady then face each other in the street, and Lady is shot and pronounced dead by the town coroner. The only two contestants left standing then are the preacher and Herod (God and The Devil). When the clocktower strikes the hour, an indication for the shooting to begin, Herod is astonished to hear explosions going off all over town. The preacher and Lady had, earlier, discovered a cache of dynamite (owned by the Kid), and used it to destroy Herod's mansion, the clock tower, and the bank where Herod's money was being kept. After all of this, Herod is doubly stunned to see Lady walking down the street toward him. The preacher had faked her death, so she could "come back from the dead" to kill Herod. Lady shoots Herod several times, making sure he's dead, then she turns to the preacher and tosses him the marshal's badge that had once belonged to her father. Satisfued that the town would be safe in the preacher's care, Lady gets on her horse and rides away. OUR REVIEW: On seeing this motion picture one can understand why Leonardo DiCaprio was somewhat disinterested in it. All of the characters are stereotypical, flat, and decidedly two-dimensional: hardly an effort for someone as talented as DiCaprio. We understand, however, that he was likely drawn to the project by the prospect of working with Gene Hackman, one of the finest actors in the business. 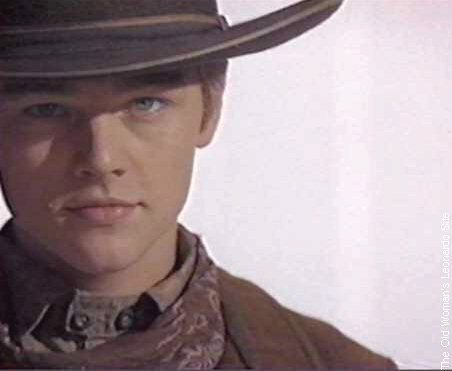 For the most part, DiCaprio was successful in embuing his "Kid", a playful braggart with an overwhelming desire to win the respect of his gun-slinger father, with enough charisma to keep viewers interested in him. 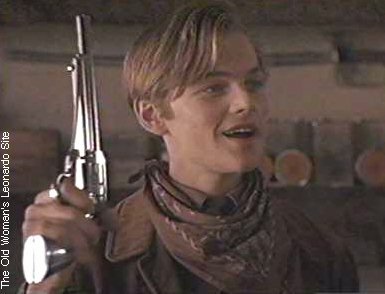 When DiCaprio isn't on the screen, he's sorely missed, and long portions of the move drag during his absence. The scene in which he dies is the only one which promotes any kind of an emotional response from the audience. With Kid's passing, the rest of the film seems anticlimactic and disinteresting. 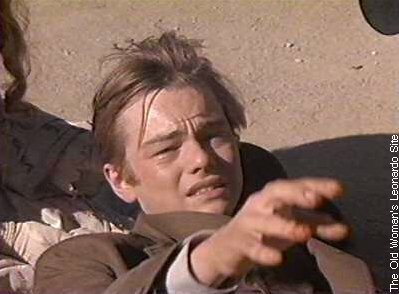 This in itself is a tribute to DiCaprio's ability as a character actor. MORE IMAGES FROM "THE QUICK AND THE DEAD"